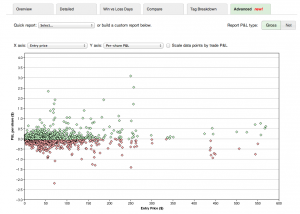 Back in April, we introduced the Advanced Reports to Tradervue. At that time, there were just three, and we added another when we introduced liquidity reporting. 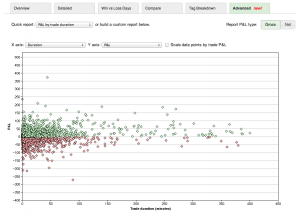 You can choose a “Quick report” from the drop-down at the top, or you can customize the reports by choosing exactly what to plot on each axis of the chart. You can also add a third dimension, where each trade data point is sized based on the trade P&L (either gross or net, depending on your report setting). These changes are big, and give you views into your data that weren’t possible before. They are available today for all silver and gold subscribers, so go take a look! And if you’re not yet on the silver or gold plans, sign up today for a free trial! We have added options support for E*Trade! As always, if there is a broker or trading platform you are using that we don’t yet support, or don’t have complete support for, let us know and we’ll try to build in what you need. 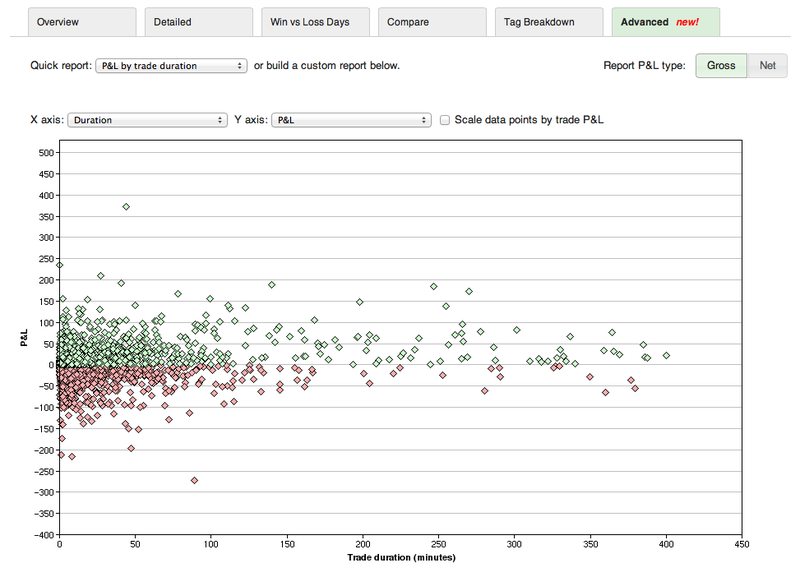 You can now click on a specific market day type, such as “Trend down”, and analyze only the trades you made on days where the market was in a trend-down day. 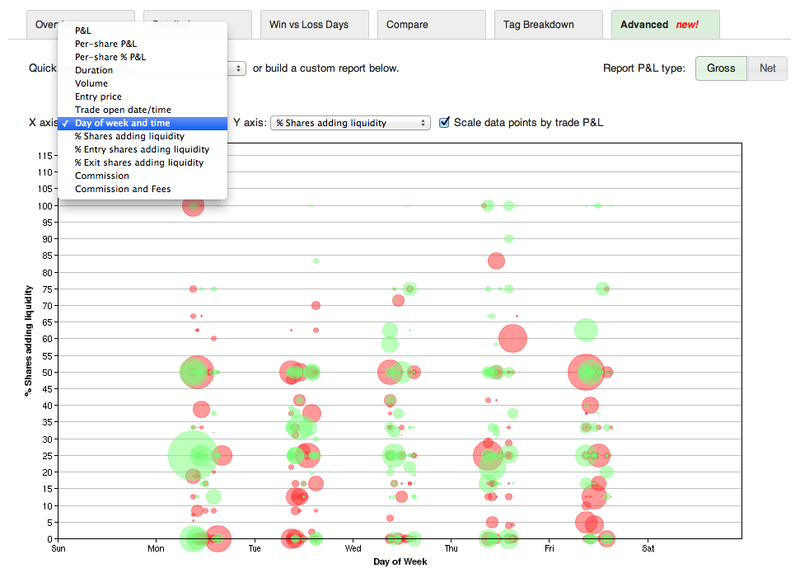 For a refresher on how Tradervue defines the different day types, see this post. Tradervue has always offered powerful filtering capability, allowing you to narrow down your trades to just the ones you want to see and analyze. Today, we’ve made this dramatically more powerful by adding the ability to drill down from the detailed reports to refine your filter. We could now click on the 9:00 bar, to filter by only trades on Mondays in the 9:00 hour. And we can see that we are indeed doing something different on Mondays on the open. We can now use any of the other reports, or even look more closely at the individual trades, and analyze what we’re doing differently on those first trades of the week. It’s not just days and times; this works with the Instrument/Price/Volume, Days/Times, Market Behavior, and Liquidity groups on the Detailed reports tab. It also works on the Compare tab. And when you click in one of the reports, the new filter is additive to the existing filter – so you can refine your filter as you go. 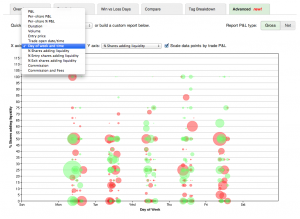 This is quite powerful – give it a try with your own trading data, and see what you can uncover! 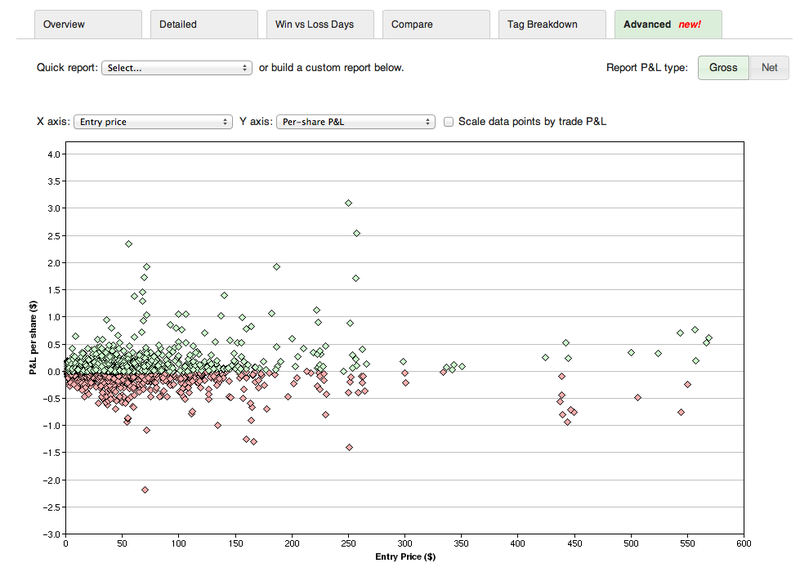 Interactive reports are available for all silver and gold subscribers. UPDATE: the Market Behavior report groups now support interactive drill-down as well!